We have family visiting so we have been busy doing lots of fun stuff which hasn't left me much time for keeping things updated here. All our local fruit is ripening and it is lovely to visit our Saturday Farmer's Market and see all the fabulous fresh and perfectly ripe produce. 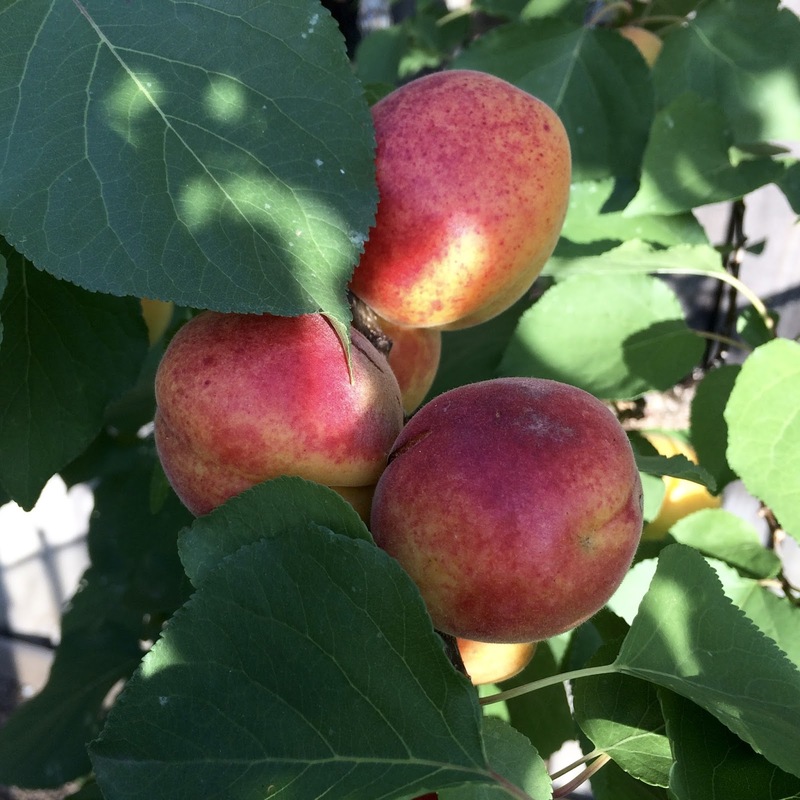 These apricots though, are on the tree in our garden...well they aren't anymore but they were. I first realized they were completely ripe when I found my greyhound wandering the garden with one held very carefully in her mouth. She wasn't sure what to do with it but she surely wasn't going to give it up to me easily! When I eventually got it from her, perfectly intact, I split it and removed the pit before offering her the juicy morsel. She wolfed it down and spent many happy moments apricot hunting in the following few days. I decided I'd better pick the rest! They were perfectly juicy and sweet. 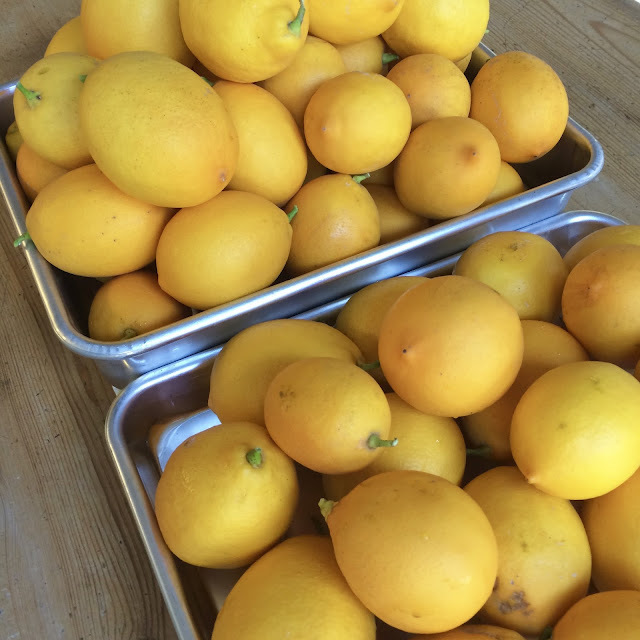 We also picked the rest of the lemons on our trees. I've made mouth puckering lemonade, gluten free lemon drizzle cake and have plans for a lemon cheesecake with a hazelnut crust at the weekend. 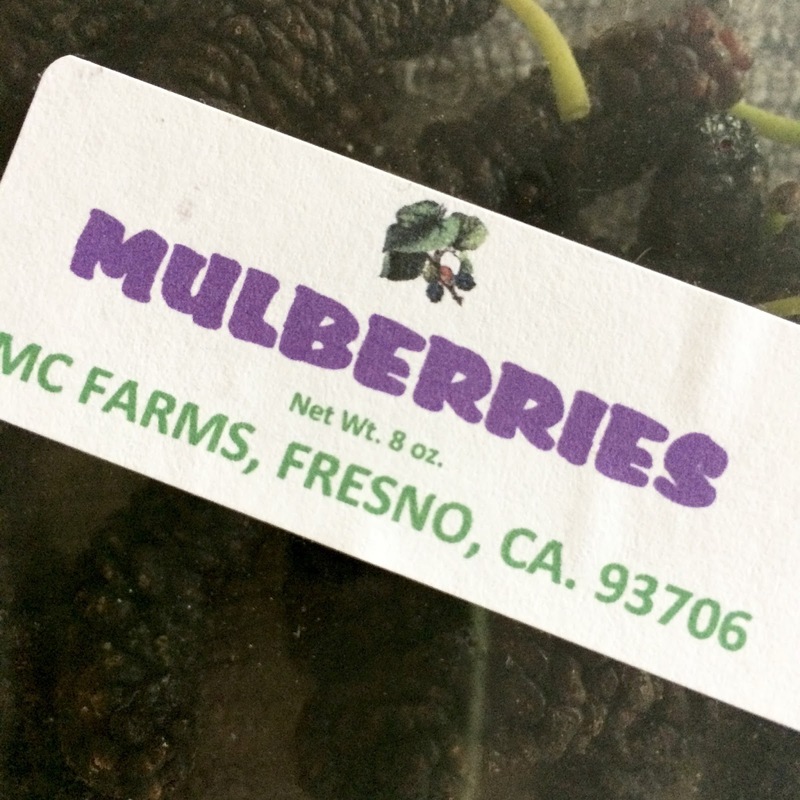 At the Farmer's market last Saturday one of the farmers I buy from had mulberries. I'd never seen them before, let alone tasted one. 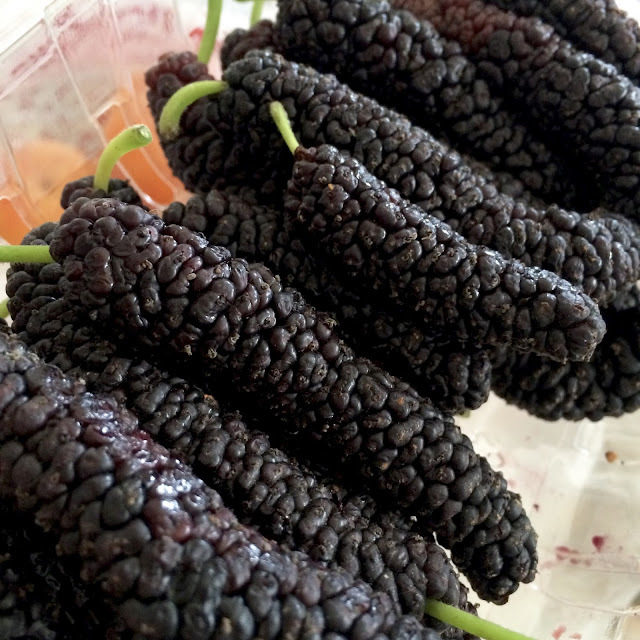 They look like elongated blackberries, about 2 - 3 inches long. I bought a box so we could all taste them. The flavor is like sweet cooked blackberries, almost like jam. They do look a bit like caterpillars though! 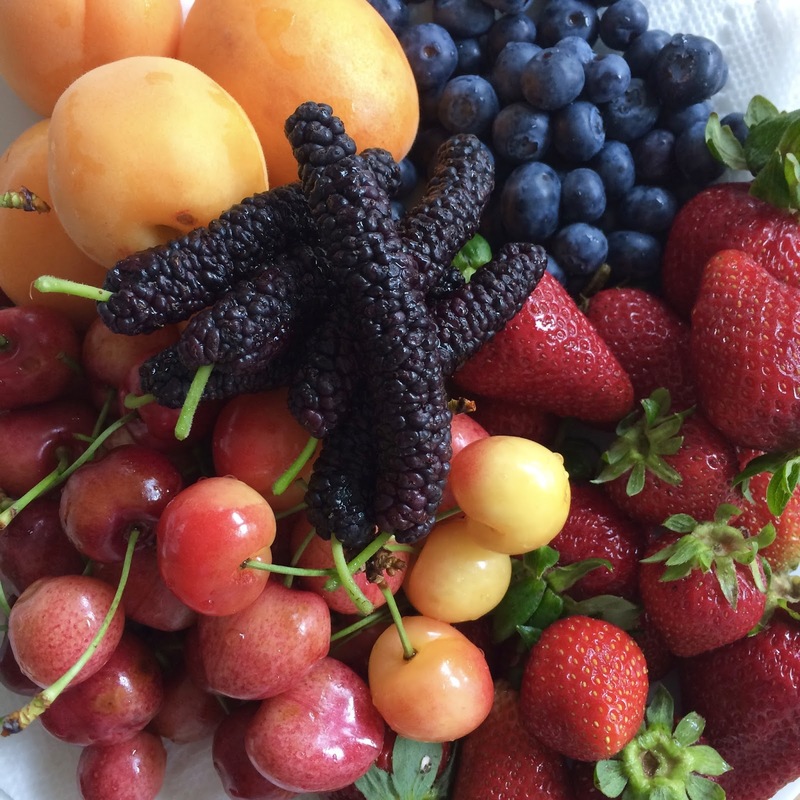 Also from the market were apricots, strawberries, blueberries, plums, nectarines, peaches and of course, cherries. Over the next couple of weeks the fruit will just get sweeter and more perfect. This is one of the things I love about living in California!